They've got a blue field that has just as much power as that little blue pill. It turns Boise State's two- and three-star recruits into top-flight players, into five-star BCS studs that you can't see coming. The blue-on-blue (uniform, field) gave the team a tremendous advantage, which is why the NCAA now mandates that Boise State can't wear their home-field blue jerseys on the turf anymore. 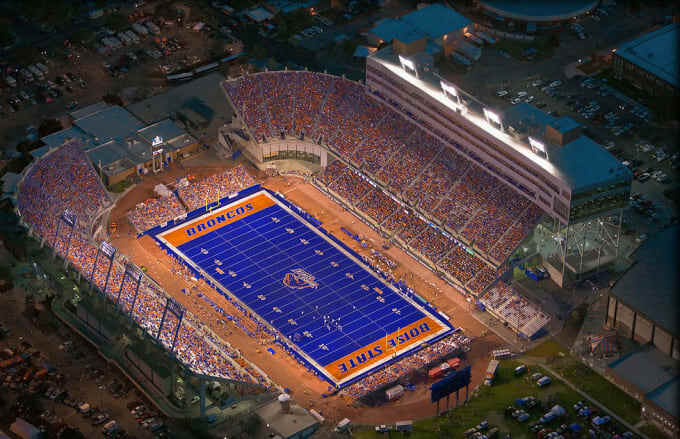 Credit BSU Athletic Director Gene Bleymaier for that striking turf; he figured if he was going to spend $750,000 on a new field it might as well be flashy. No mundane green here. Since 1986, it's been nothing but blue.